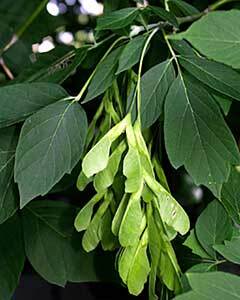 Primarily found on boxelder (Acer negundo) but also on silver maple (A. saccharinum) (Johnson and Lyon). These "bugs" are black in color with an orange banding occurring around the margins of the sclerotized portion of their hemelytra (front wings). They are approximately 1/2" in length as adults. This pest uses its piercing-sucking mouth parts to feed on foliage in the spring which can cause some distortion to the newly emerging foliage but they primarily feed on the seeds. In the late summer and early fall, however, adult boxelder bugs will congregate, sometimes by the thousands, on the sides of buildings which they later try to enter in search of a protected over-wintering site. 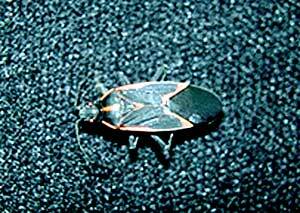 They primarily are a nuisance pest in the fall, within homes, and are of little concern while on the host plant. Adults emerge from over-wintering sites and lay eggs on, or near, the host in late April into early May. The first instars feed on fallen seeds but later migrate up into the female boxelder tree and feed on newly forming seeds and leaves. There is one generation per year (Johnson and Lyon). Injury to the host plant is of little or no concern. However, the clustering on, and entering into, homes is quite problematic and disturbing for many home-owners. Homes with female host trees within close proximity should have all vents, attic louvers, screens, etc. in good repair to prevent entry. Repeated infestations, year after year, often leads to the removal of the host tree.